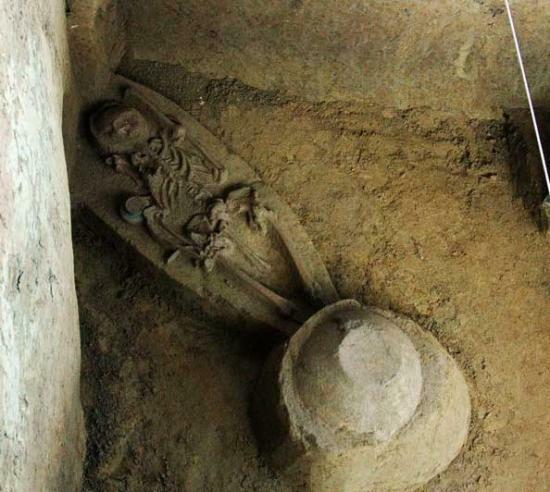 The INAH researcher manifested that due to the considerable amount of human osseous remains found in a single deposit, it is supposed that monticules served funerary purposes as a Prehispanic burial ground. 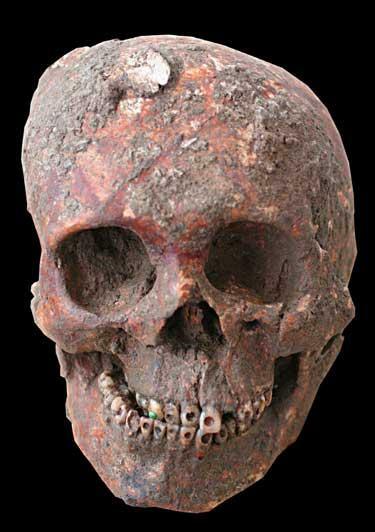 This is the largest skeleton sample recovered in the northwestern Maya area until now, if we consider that other burials have been found isolated. “2.8 kilometers north of the Great Acropolis of Comalcalco, in 3 monticules we thought were part of a Prehispanic dwelling conjunct, 66 funerary urns -with an average dimension of 35 to 75 centimeters high and diameter between 35 to 80 centimeters- containing skeletons that probably belonged to members of the Maya elite, were found. Comalcalco Archaeological Salvage Project started thanks to the agreement signed by CFE (Federal Electric Commission) and INAH to install an electric sub station, which operated from late 2010 to June 17th 2011. “CFE and INAH conducted prospection work, topographic analysis, approximation probing wells as well as random samples that could indicate the presence of Prehispanic Maya occupations in the plots acquired by CFE; the organism has been interested in the salvage project and has financed it”, commented Armijo. The archaeologist declared that after conducting a random sample on a 72 square meters surface, at the elevation called Monticule A, was found the first double urn, with a fragmented flat bowl placed atop. In December 2010 at Monticule B, were recovered 15 urns containing 13 children osseous remains, as well as other 12 skeletons associated to them. 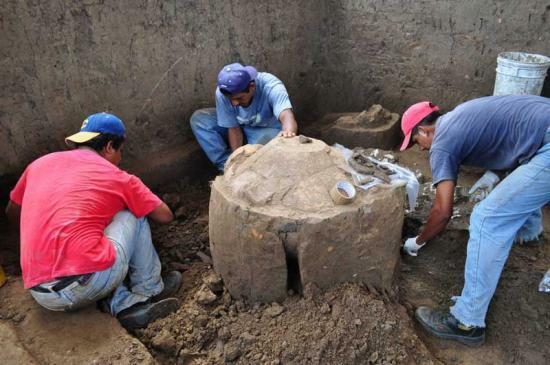 Due to the relevance of the discovery, INAH and CFE conducted a second excavation in April 2011, recovering 35 urns with remains, 35 associated human burials as well as the rests of a canine. The main feature of the collective burial at Monticule B is the fact of being 28 of them found at a 1.8 meters depth, 1 meter under the phreatic surface, on a stratum made out of oyster shells, everything covered with lime; mixed with water it became a paste that allowed remains to keep an optimal conservation state. “We believe Yokot’an Maya people that dwelled Comalcalco region used lime to avoid putrefaction and help the departed through their passage to the afterworld”, explained Armijo. Later this year, exploration of Monticule D took place: under a fired clay flattening were found 15 urns and 3 direct burials, as well as 3 ovens that “might have been used to fire the clay flattening designed to protect the funerary deposit” pointed out the INAH archaeologist. Up to now, 53 of the 66 funerary urns found have undergone micro excavation process, described by the specialist as “the meticulous and rigorous excavation in a reduced space of controlled humidity and temperature conditions, where a detailed register of elements takes place”. Responsible of coordinating work are archaeologist Ricardo Armijo and physical anthropologist Stanley Serafin, who mentioned that results of studies conducted determined that skeletons found inside urns were shrouded, as textile evidence confirms. Serafin declared that micro excavation is conducted in strict hygiene measures to avoid contamination of material. “Studies such as analyses of soil inside urns to determine the presence of organic material such as textiles and feathers, are still taking place, but results will help verifying if individuals were richly attired at the moment of the burial. 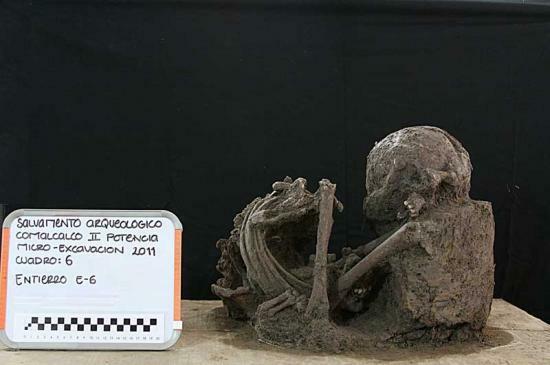 “Analyses of bones and DNA will help determining age, gender, as well as pathologic and genetic patterns to establish if there were individuals from regions other than Comalcalco, if they were ill or undernourished; this information will help us interpreting the nature of this funerary ritual”, concluded the anthropologist.